If you are like many other investors, one of your most significant concerns may be falling short of your financial goals. RAA offers professional investment management services for your 401(k), IRA, or after-tax retirement accounts to help you reach those goals over the course of your life and career. Each of our portfolios is crafted based on several factors, including valuations, economic conditions, and technical analysis trends that may influence future market performance. These portfolio strategies are determined by an expert Investment Policy Committee and executed by a team of seasoned industry professionals, and then stress-tested to ensure we are prepared for whatever comes next in the market. We understand that concerns about market volatility and performance might keep you up at night, which is why our portfolios are continuously monitored and positioned for the ever-changing economic environment, so you can focus on what matters most. Before you are invested in any portfolio, you will be given an assessment to determine your tolerance for investment risk. Your risk tolerance, combined with your specific needs and objectives, will allow us to allocate your assets in the correct mix of stocks and bonds to keep you on the path toward the financial future you are working hard to achieve. A recent study by Vanguard shows that working with an advisor can provide an estimated additional 3.75% investment return each year.1 Over time, this can add a significant amount to your retirement fund. 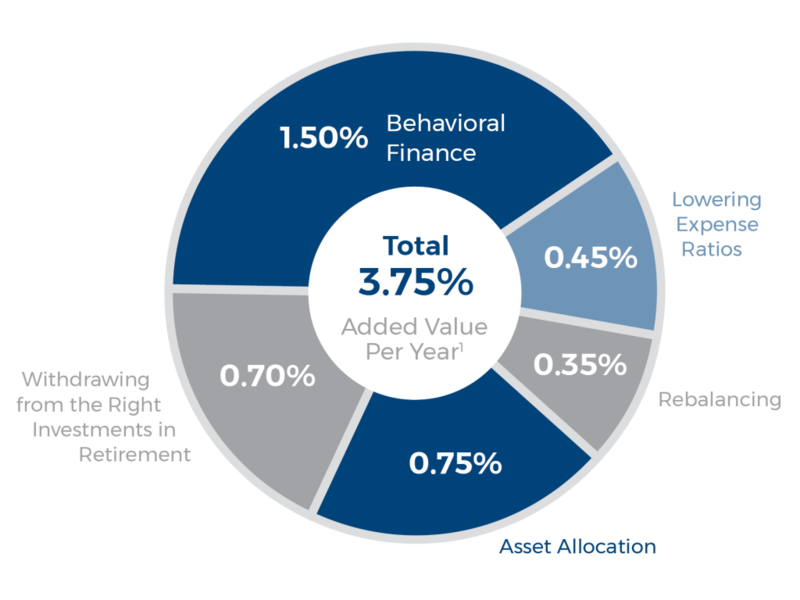 While services including asset allocation, rebalancing, lowering expense ratios, and helping you withdraw from the right investments in retirement contribute to this benefit, the most impactful is the behavioral coaching an advisor can provide to help you avoid common investor mistakes that can be detrimental to your chances of reaching your goals. 1Information obtained from the Vanguard report titled “Putting a Value on Your Value: Quantifying Vanguard Advisor’s Alpha®.” Vanguard is an independent third party and is not associated with RAA. An informed client is a comfortable client, and our approach to communication is driven by our clients’ desires to better understand financial markets and how they affect their planning decisions. Any day the U.S. stock market moves significantly, you can expect an email from us providing a detailed analysis discussing what is driving the market and highlights of our expectations. Do you know how to maximize your airline benefits?